The huge well-crafted stone at the gate of Beijing's Milu Park is engraved with about 50 words in the most spoken languages in the world. The words, at the park, which is about 30 kilometres south of Beijing, simply carry a welcome message in different languages. This demonstrates a gesture of closeness to make various visitors feel at home. Among the words, which simply say welcome, is the Swahili word "KARIBU." Laying innocently but majestically shouting out among the many other words, "Karibu" was the only word in a local African language on the display. The deputy director of Beijing Milu Park, Guo Geng, asked the group of journalists to look and see whether there were any words representing their languages. "Go ahead and see if is there are any words you recognize in your native languages, apart from English and French," Mr Guo told us in Chinese through an interpreter. Of course, immediately I saw the word "KARIBU," engraved in capital letters in green paint. "See, we cater to welcome all visitors here," the deputy director said. The joy filled me. I first felt special but also honored by the welcome in my own local language over 13,000 kilometres away from home. The closest to Swahili in Africa was Arabic, and the rest were European and South East Asia languages. This is the second tourist attraction after the Palace Museum, in the heart of Beijing, to use Swahili. At the museum Swahili is used to guide tourists. The Milu Park is located in Nanhaizi in Daxing, a Beijing suburb. It was introduced 29 years ago as a sanctuary for the extinct Milu or Pere David's deer. It stands at what was an imperial hunting park a century ago. The deer were completely wiped out in China at the beginning of the 20th century, as a result of over hunting, loss of habitats, natural disasters and war. The Pere David's deer lived historically in wetlands, which were scatted across China in Shanxi Province in the west to the Liaoning Province in the north to Zhejiang Province and the eastern coastal plain. Fortunately, the Duke of Bedford saved the deer in his estate of Woburn Abbey. By 1895 there were 18 deer left at the duke's estate in Britain. Nevertheless, the number grew to 88 by 1914 before rising to 255 in 1948. 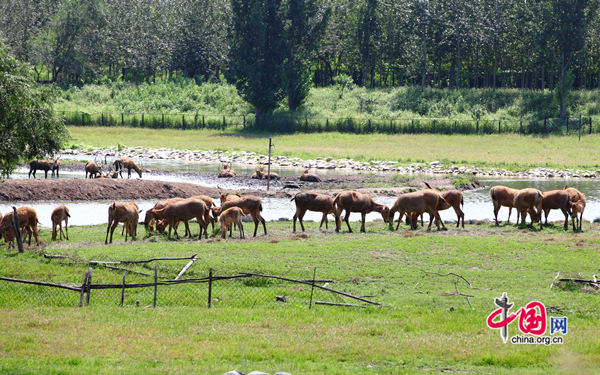 It was in 1985 that the Pere David's deer were returned to their homeland to the place they were named after, Nan Haizi, Beijing where also there is a conservation research center. A huge stone at Beijing's Milu Park, which protects endangered deer, welcomes visitors using the most commonly spoken languages in the world.